Added new buttons for Airachnid and Starscream from "Partners". You can download all the mp3s from the soundboard here: [link] :3 This includes both Autobots and Decepticons. From the left: Knockout and Starscream. where can I find the laser soundboard? Any hopes of everything through Predacons Rising being added? I'd love to hear some more of Wheeljack's lines, Ultra Magnus, and more of Knock Out. Any hopes of Dreadwing being added here? I was quick enough to make it sound like KO said, "Whoa, sweet rims." If that was my OC he was talking to, her face would go maroon. Knockout : *whistle* Sweeet riiimss..
Ooh! Can you add Dreadwing!? Pretty, pretty please!? Where did you get Breakdown's 'back for seconds'? When you double click the "At Some Point" button, it sounds like a slowly malfunctioning computer. 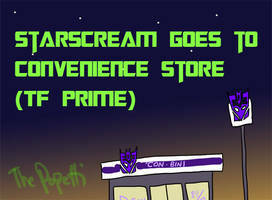 Megatron: DO NOT TAKE ME AS A FOOL STARSCREAM! I tried to download the file from the link as well as the download option from your deviant. Is it just me or is it broken? I like Starscream and Knockout's quots the best Great job!!! You need "Prepare for Surgery" (the whole line) on that list or am I just not looking right? Oh Gods, "...Master!" absolutely kills me.